Biology in Science Fiction: How Dangerous is Biohacking? Tom Knight, a senior research scientist at MIT who is cofounding a synthetic biology company called Ginkgo BioWorks, sees the transformative value of biohacking - the phrase used to describe doing to living organisms what computer hackers have long done with electronics. But he has reservations about putting such power into the hands of amateurs. "I think if the safety issues can be addressed, there is a big opportunity," Knight said. "It's a huge issue; how do you regulate so [people] don't cause havoc. I have mixed feelings about regulation. While I'd prefer my next-door-neighbor not be developing potentially virulent new strains of E. coli, the regulation of at-home labs here in the US has been, IMHO, rather excessive. 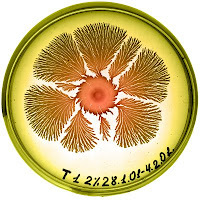 A case in point is that of artist Steven Kurtz, who was arrested in 2004 by the FBI as a possible bioterrorist because he was preparing an art installation in his home that involved nonpathogenic bacteria. He was finally cleared of charges in April of this year. While it may sound like science fiction, biohacking is here and we should start thinking about if and how it should be regulated. I'm hoping that we figure out some kind of medium between assuming any non-scientist with a vial of bacteria is a terrorist, and letting anyone who can afford to purchase a few enzymes free reign. Maybe the solution is education. If more people understood biohacking techniques - and the possible risks - I think the risk of potentially dangerous mishaps could be minimized. Malicious hacking, on the other hand, I'm not sure we can do anything about.